1,500 of taxa consists of 1,000 herbaceous and 500 woody trees. Special Collections:Exotic species introductions, timber trees, economic plants such as rattans and Gnetum spp. Species of tropical African Rainforest, extensive collection of regional floraPalms of Africa, endemics of Mount Cameroon, Musa. Conservation through Cultivation programme: Irvingia gabonensis, Garcinia cola, Afrostyrax kameruensis, Cola spp., Prunus africana, Gnetum, Pterocarpus soyauxii, Diospyros, Rauwolfia vomitoria, Nauclea diderichii, Terminalia spp., Enantia chlorantha, Eremomastax speciosa, Bryophyllum spp. and Physostigma venenosum. 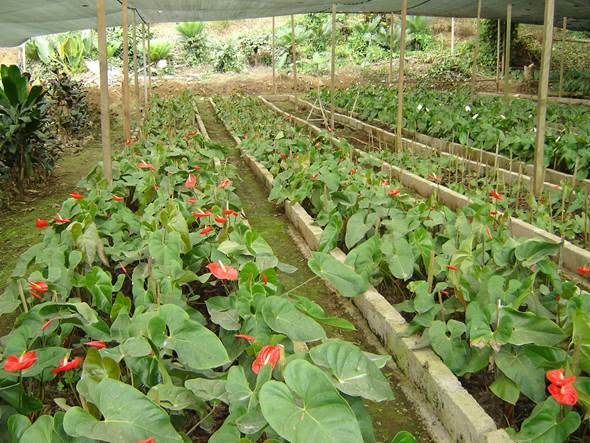 The Community-Based Floriculture Industry Development Project (CFIDP) aims to understand the cost at and scale to which it is possible for Cameroon to develop a strong floriculture industry. The project, which is funded by the US Department of Agriculture, has helped introduce UN FAO Good Agricultural Practices (GAP) to farmers, improved the local economy and transformed the region’s landscape. 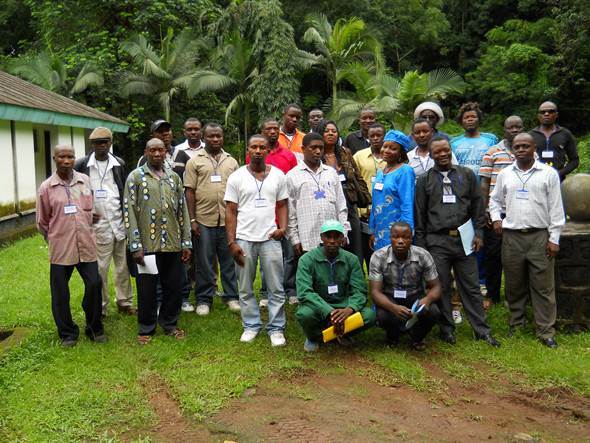 Limbe Botanic Garden has also seen an increased number of visitors as a result of the project. The CFIDP aims to evaluate Cameroon’s efficiency in producing and marketing high-quality tropical cut-flowers of an international horticultural standard. The project began in 2003 by working with the Cameroonian community, introducing locals to GAP through training workshops and radio broadcasts. Farmers also worked with the project’s organisers to select pilot farms on which GAP could be used, test cultivars and propagate good quality seeds and seedlings. Surveys of the local and European markets were conducted to understand whether a floriculture industry could be developed in Cameroon. 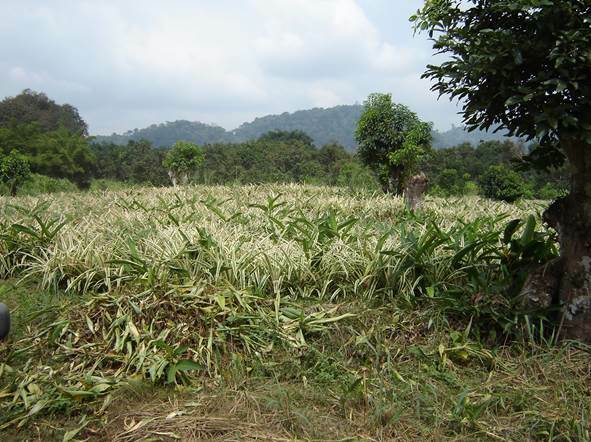 The CFIDP has since created a new farming system in the region. GAP are now being implemented by nearly all farmers, and flower production has become another source of income for communities. The local economy has benefited and the livelihoods of individuals have improved. Some farmers have themselves been able to hire unemployed members of the community, giving these people the opportunity to earn money and learn about the plants being grown. The landscape has also been transformed. Areas once covered by weeds have now become flower farms, and destructive erosion has been reduced in hilly regions. In addition, some native species and plants that were previously identified as weeds have now been introduced to the list of cut-flowers and have the potential to be sold worldwide. Limbe Botanic Garden has seen an increase in attendance as a result of the project, with visitors wanting to find out more about flower production and GAP. CFIDP organisers aim to continue this promising industry. Flower farmers in the region are currently the main suppliers to Cameroon’s biggest city, Douala. With more funding, it is hoped a flower exhibition will be organised and training can be provided to producers on floriculture processing and packaging. Organisers would also like to create a database of the common English/French and scientific names of flower species grown. What Encourages Me to Visit a Garden?